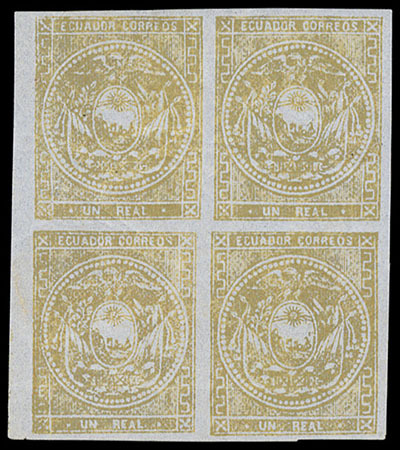 Ecuador, 1871, 1r Yellow, Bluish Paper, left margin block of 4 (positions 55-56 / 64-65), full o.g., ample to large margins, light horizontal crease affecting bottom pair, otherwise Very Fine, mint blocks on this paper are exceedingly rare, ex-Goeggel. Scott No. 8 Estimate $1,500 - 2,000. 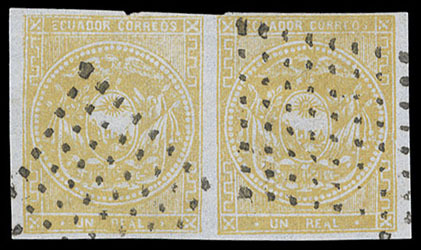 Ecuador, 1871, 1r Yellow, Bluish Paper, horizontal pair, dotted lozenge cancels, clear to large margins, F.-V.F. Scott No. 8 Estimate $75 - 100. Ecuador, 1871, 1r Yellow, Bluish Paper, block of 4, dotted lozenge and town cancels, ample margins, couple small tears in top left stamp, otherwise Very Fine, a very scarce used multiple. Ecuador, 1871, 1r Yellow on Bluish, vertical pair, Chimbo fancy "flower" cancels, ample to large margins, Very Fine. Scott No. 8 Estimate $100 - 150. 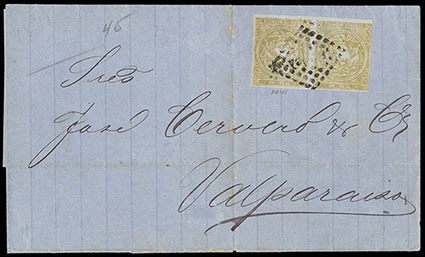 Ecuador, 1871, 1r Yellow on Bluish, Horizontal Pair, margins large to just touching at right, canceled by "Franca" in dotted lozenge handstamp of Guayaquil on 1871 folded letter sheet to Valparaiso, Chile; cover with small split along vertical file fold, Very Fine, ex-Goeggel. 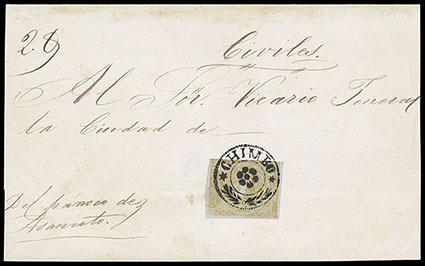 ONE OF APPROXIMATELY TEN FIRST ISSUE COVERS KNOWN ADDRESSED TO CHILE. 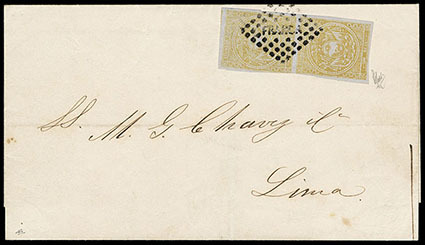 Ecuador, 1871, 1r Yellow on Bluish, Bottom Right Corner Margin Vertical Pair, positions 81 / 90, full margins and portions of margin rule showing in sheet margins, canceled by "Franca" in dotted lozenge handstamp of Guayaquil on 1872 mourning folded letter sheet to Lima, Peru, with receiving backstamp, Very Fine and choice, ex-Yardley and Goeggel. Scott No. 8 Estimate $1,000 - 1,500. Ecuador, 1871, 1r Yellow, Bluish Paper, Horizontal Strip of Four and Single, full margins, in combination with 1871, ½r blue on bluish on Judicial front to Ambato, all tied by "Guaranda, 9 Dec" cds's, manuscript "10¾ oz." weight notation at upper right; ½r stamp with small corner crease, otherwise Very Fine; with 2014 Moorhouse certificate. Scott No. 8+7 Estimate $750 - 1,000. 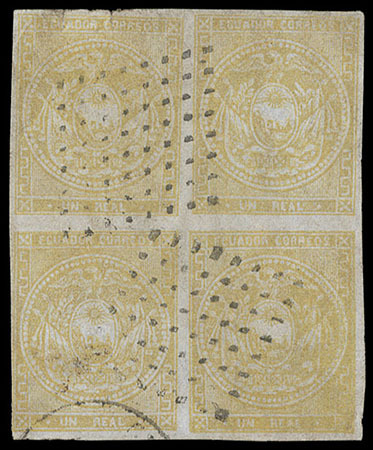 Ecuador, 1871, 1r Yellow on Bluish, Horizontal Pair, oily impression, clear to large margins, canceled by dotted lozenge handstamp on reduced Judicial front to Quito, with matching "Guaranda, 5 May" cds alongside and manuscript "4 oz" weight notation at upper left; left stamp with small repaired nick at top, F.-V.F. 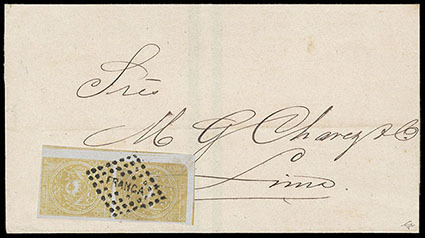 Ecuador, 1871, 1r Yellow on Bluish, Vertical Pair, ample to large margins, tied by neat "Franca" in dotted lozenge handstamp of Guayaquil on 1872 folded letter sheet to Lima, Peru, reverse with receiving cds, Very Fine and choice, ex-Goeggel; signed Holcombe. Ecuador, 1871, 1r Yellow on Bluish, tied by bold "Chimbo" fancy flower handstamp on part Judicial front originating in Ascancoto and posted at Chimbo, Very Fine, a rare usage originating from this tiny town.